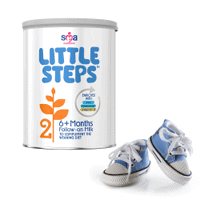 You can get a free pack of LITTLE STEPS® Milk from Insiders as they have 1500 of these to giveaway. Follow our link, click Subscribe button and then submit your details to enter the contest for a chance to get one of these. Click on “GET IT HERE” button and then follow instructions given above to get 1 of 1500 of these giveaways.